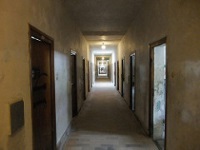 About 10 miles (16km) to the northwest of Munich on the Stuttgart Autobahn is the town of Dachau. Once a quiet artists' community, it became the site of the first notorious Nazi 'death camp', where thousands of perceived enemies of the Third Reich were imprisoned, starved, and killed between 1933 and 1945. The camp has now been turned into a memorial museum to the prisoners (67,000 were liberated alive by the US Army on April 28, 1945). The museum contains three memorial chapels. The Lagerstrasse, the main camp road, still exists, lined with poplar trees, but only two of the original 32 barracks that lined it remain, having been rebuilt to illustrate the conditions endured by the prisoners. The original kitchen, laundry and shower block is now a museum containing exhibits, photographs and documents depicting the persecution of Jews and other prisoners. The exhibitions are often very personal and include the accounts and stories of prisoners. The memorial is a sobering experience, and may not be suitable for young children. Opening times: Memorial/Museum open daily 9am to 5pm; Library and Archive available by appointment only between 9am and 5pm Tuesday to Friday. Admission: Free. Small charges apply for audio guides and guided tours.